Flexibility, livable wages and room for growth. These are just a few things that make up a "good" job. That's according to the National Domestic Workers Alliance, which wants to make sure the growing number of on-demand jobs are good jobs. This week, it announced an initiative called the Good Work Code, which aims to set standards for on-demand firms. As it stands now, companies like Uber, Handy and Alfred are giving workers unprecedented flexibility. But many of these firms rely on contract workers to perform services, which means workers don't get minimum wage, overtime compensation, unemployment insurance or protection from workplace discrimination. They aren't entitled to benefits and don't have the right to join a union. Some have said the current options (contract workers or employees) are too limited for this new workforce. Regulatory constraints keep companies from testing out what new models might look like. 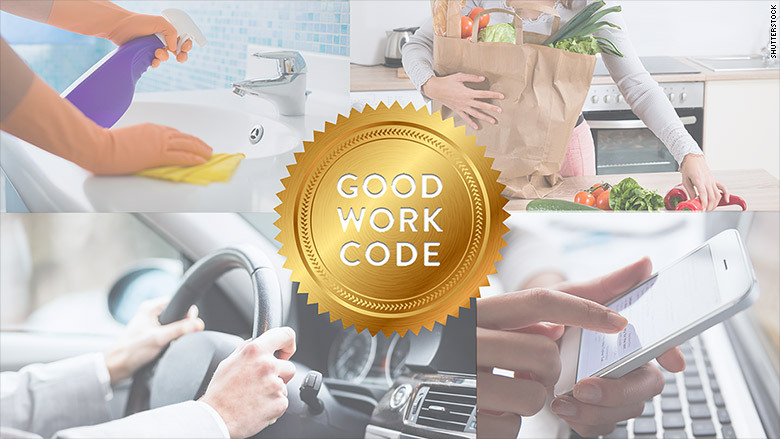 The Good Work Code has eight foundational pillars: safety, stability and flexibility, transparency, shared prosperity, a livable wage, inclusion and input, support and connection, growth and development. The goal is to get companies to "pledge" to think about workers' rights early on -- and create policies in their best interest. "Silicon Valley leaders and employers want to do the right thing, sometimes it's just not clear how exactly to do that," said Palak Shah, social innovations director at NDWA. Shah spent months consulting with tech companies to better understand their needs. Though she is not yet naming companies who have committed, the response has been incredibly positive. And that's a big part of the battle. "What we want is for them to agree that this is the direction they want to go," she said. She hopes the code will eventually serve as an "overarching framework to guide the on-demand economy in creating good work." In June, the organization announced the Fair Care Pledge with Care.com. Similar to the Good Work Code, it sets standards for treatment of caregivers. The National Domestic Workers Alliance has already successfully expanded basic benefits like overtime pay and minimum wage to caretakers in five states. "The idea is that we can put out a vision for good work -- and how to foster good work," said Shah. They already have one powerful champion: President Barack Obama. NDWA director Ai-Jen Poo introduced the Good Work Code at the White House's Worker Voice summit on Wednesday. The event, a White House first, addressed issues facing 21st century workers and explored ways to empower them. "Many parts of the economy are like the Wild, Wild West," Poo said. "There aren't clear guidelines. We need to promote these standards and be clear." And if anyone is able to innovate, it's Silicon Valley. "They've done a great job at solving for the needs of investors and customers. We think this is a necessary next step," added Shah.